Welcome to our world of fun and "Life Lessons"
The FirstSwing Foundation and Executive Director Phil Rognier travelled to New Zealand and Australia with the 2012 edition of "Baseball Connect" in January/February 2012. It was very encouraging to see the rapid interest and development of baseball, in both New Zealand and Australia. The Baseball New Zealand organization, headed by Ryan Flynn, has made great progress in teaching the basic game and creating a fundamental infrastructure for the game's long term growth. 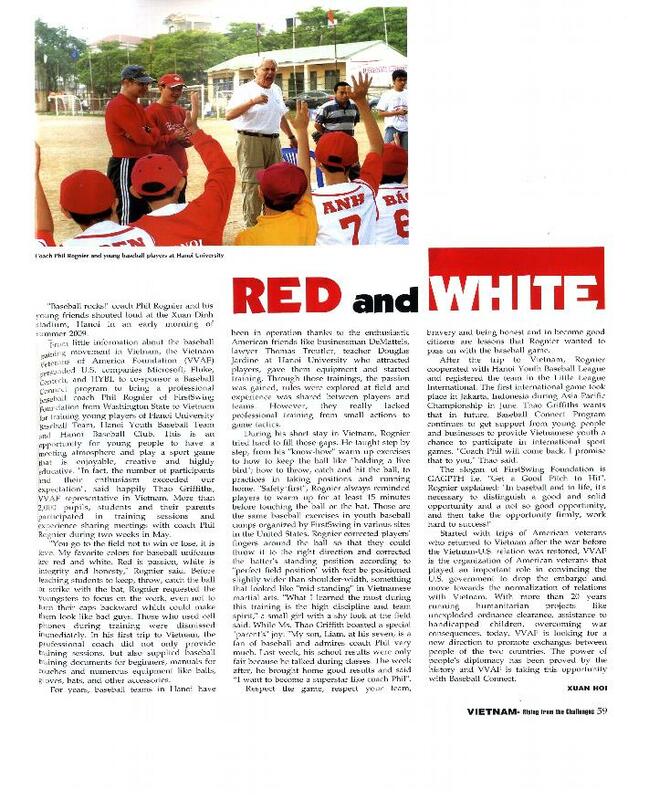 The youngsters, coaches, parents, schools, and communities have embraced America's pastime, and are ambitiously striving to improve their skill sets and become competitive in international play. 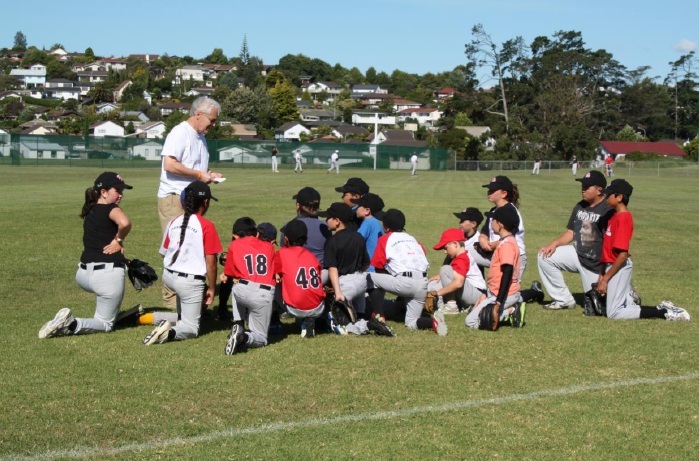 "Baseball Connect" and Coach Phil provided coach and player camps/clinics in a number of different geographical areas in New Zealand. Most of the instruction centered upon fundamental mechanics/techniques, and actively involved the coaches, parents, and players. The number one deficiency in their programs at this time is repetitions. The populace has not been exposed to baseball for enough time in order for the players to have mastered the fundamental skill sets. All the activities provided by Coach Phil were focused on simple baseball drills and mastering fundamentals. The fields and play areas are expansive and perfect for baseball. Albeit, there are many more cricket sites and soccer pitches, the baseballers have easily adapted. FirstSwing provided logistical support with balls, bats, gear, and the newly published manual, Simply Baseball, A Guide for Youth Coaches and Parents. An abridged handbook was provided for the young players and schools. It is quite obvious that the New Zealand baseball organization, youth, parents, schools, and communities wish to increase the participation in baseball as an added competitive sport for all to enjoy. All the young players displayed a very diligent work ethic and had fun at the clinics and events. "Baseball Connect" joined with Major League Baseball the first few days in a weeklong camp held at H-P Park. It was a very rewarding experience and had professionals Mark Malancon (Boston) and Nick Hundley (San Diego) as guest instructors. There were youngsters from 6-18 working on all the mechanics of the game as well as participating in competitions and games. Tom Nicholson of MLB and local coaches provided an excellent learning environment as well as giving out cool baseball gear and tee shirts. An extra added attraction was the appearance of Te Wara Bishop, the first local player to be signed by MLB. The weather was "baseball perfect" and the campers not only worked hard but had a ton of fun in the sun! The schools in and about Auckland have begun to embrace baseball and many have formal baseball classes and teams. Their colleges (U.S. high schools) have begun basic programs and are forming an inter-school league. These schools have proficient coaches and are focusing on the development of competitive teams, and teaching the important life lessons inherent in the game. Although, the basic dynamics of baseball are centered on club ball, each community is actively working to have the game become a viable choice for kids of all ages and abilities. Baseball New Zealand has worked hard to procure community and corporate involvement. Many local and national companies have stepped up to provide some basic financial and/or in-kind support, and the media has helped to promote the program as well. Baseball New Zealand has created a number of national teams(13U-18U) that are competing on the international level. Their immediate goal is to have a representative team ready for the next World Baseball Classic. In fact, while "Baseball Connect" was in Auckland, the 15U team played in Guam and finished second in the tourney! On February 15, Baseball New Zealand hosted the movie premier of Moneyball in Auckland. It was greatly attended by fans, players, families, and a number of local celebrities. Ryan Flynn provided the keynote remarks and inspired the audience to get involved with baseball and help spread the word to youngsters and all who want to be involved. Moreover, Microsoft, Tektronix, and FirstSwing have had tee shirts made to popularize Kiwi Ball and further assist New Zealand Baseball in continuing its mission to grow and provide the community with the educational and fun experience of the game! "Baseball Connect" will continue to supply those Down Under with bats, balls, gloves, et al in a cooperative effort to help baseball develop and become a national sport! Australia has a more developed baseball program for youth, schools, and even has a MLB Academy. Their national teams fare well in international competition and have had a few players play professionally in the U.S. "Baseball Connect" chose to visit Tasmania (small island off the southeastern coast) and see if there was any interest in playing and developing the game. Coach Phil did connect with a couple of coaches and groups, but they have suffered some setbacks each time they have tried to create an interest in the game. There is a budding adult baseball association and one youth league outside Hobart. FirstSwing made contact and provided the Simply Baseball manual to Hutchins School and will follow up. It is hoped that Baseball New Zealand and other Australian teams/coaches will assist the Tasmanian effort so that they too can get into the game! FirstSwing and the "Baseball Connect" program will continue to work with the Down Under organizations in their quest to develop the game and expose youngsters to a viable outdoor classroom that is fun and teaches many of the lessons of life. There is no question that the people of New Zealand enjoy baseball and are anxious to play and compete at every level. At this point, baseball is on the tipping point. In order for there to be consistent and significant growth New Zealand Baseball must develop a cadre of non-parent coaches/teachers and find a source of financial support that will sustain the momentum so baseball may become an established part of the sports community. It is quite obvious that the youngsters, parents, coaches, schools, and community want to PLAY BALL!!! GAGPTH! Notes: While Down Under, Coach Phil learned many new words and saw a number of interesting flora and fauna. Albeit, he missed seeing the kiwi(other than on tees, flags, candy, etc), he did see everything from a real Tasmanian Devil(yeow! ), to various types of kangaroos, boomerangs, didgeridoos, net ball, real tennis, "touch" rugby, and tasted many delicious culinary delights. By the way, peihipaoro is Maori for baseball, a pademelon is a type of kangaroo, and a pavlova is a dessert to DIE FOR!!! GAGPTH!